SAN FRANCISCO – Audacy, a space communications startup, announced a memorandum of understanding March 11 with Iceye, a Finnish radar satellite startup, to explore how Audacy’s planned inter-satellite data relay network could support Iceye’s planned constellation. Currently, Iceye’s second satellite, Iceye-X2, passes over ground stations 25 times per day. Those passes provide Iceye with opportunities to send commands to the spacecraft and download synthetic aperture radar imagery and data. With a space-based data relay network, Iceye and other Earth observation companies would be able to task satellites to gather imagery far more often, Ralph Ewig, Audacy chief executive, said in February at the SmallSat Symposium in Mountain View, California. 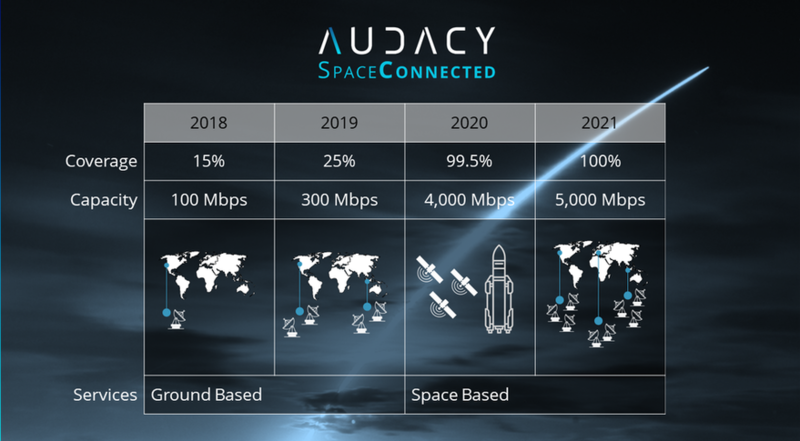 Audacy plans to begin offering global communications services through a network of satellites weighing hundreds of kilograms in medium Earth orbit in 2021. As it builds that constellation, Audacy plans to begin serving customers in 2019 with a network of ground stations. Audacy launched its first satellite, a cubesat technology demonstrator called Audacy Zero, in December on the SpaceX Falcon 9 rideshare mission from Vandenberg Air Force Base in California. It was one of the 64 satellites sent aloft on the flight. Audacy has not been able to establish contact with the cubesat. Problems with Audacy Zero will have no impact on the schedule for Audacy’s constellation, Amanda Chia, Audacy business development head for Asia and Europe, said by email. Iceye plans to launch at least five satellite in 2019.Each successive generation will show improvement in resolution and data-gathering capability, Rafal Modrzewski, Iceye chief executive and founder, told SpaceNews at the SmallSat Symposium. Iceye X2, for example, produces at least five times as much data as Iceye’s first satellite launched in January 2018. Initially, the Audacy-Iceye partnership is likely to focus on satellite tasking. As Audacy’s network develops, Iceye may eventually downlink imagery and data through the communications constellation, Iceye and Audacy officials said.